Making the administrative side of childcare more efficient than ever is how we’ve made it possible for our customers to give the best childcare possible. 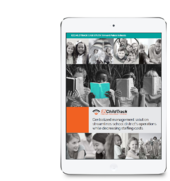 We’re looking forward to having a chat with you about how EZChildTrack can solve your biggest administrative hang-ups! Billed as #NAA19, the annual convention for afterschool program leaders and teachers takes place in less than a week. Over 175 educational sessions are planned. New session formats will be introduced: Workshops, Panels, Spark, and Leadership Intensives. You have over 20 hours of networking available to rub elbows with leadership and industry experts from across the United States. Gina Warner, the President and CEO of the National Afterschool Association, former U.S. Senate staffer and citywide out-of-school time leader. Melody Herzfeld, drama teacher at Marjorie Stoneman Douglas High School and Tony Award Winner, who sheltered 65 students in her classroom during the Valentine’s Day tragedy last year. She continues to contribute to community outreach to parents and support staff. Her students wrote and performed the original song “Shine” at the Tony Awards. Gretchen Rubin, author of numerous bestsellers, including The Four Tendencies, as well as the host of the top-ranked “Happier with Gretchen Rubin” podcast. Alton Fitzgerald White, who plays Mufasa in Broadway’s The Lion King. His presentation includes songs and performances throughout. James Casap, the Education Evangelist at Google, promotes the power and potential of technology and the web as enabling and supporting tools for education. With over 175 sessions to choose from, there is something for everyone. Igniting Leaders with Communities of Practice, helping you to determine the elements required to inspire afterschool leadership within the practice community. Tips and Resources for Bringing SEL (Social and Emotional Learning) to Afterschool Programs. Fund Development 1-2-3: Where, What, and How, helping you learn fund-raising techniques for development of your programs. How to Use Technology to Attract and Retain Today’s Parents, where you will learn how parents depend on technology for communication, social contact, finance management, and more. These are just four of the sessions available to you on the first day at this year’s NAA Convention. Find even more educational opportunities here. Beyond the keynote presentations and educational sessions, the NAA is hosting an Interactive Learning Expo for professional development. EZChildTrack is proud to be one of over 100 exhibitors this year. We look forward to meeting you and learning your needs so we can continue to improve our product. We hope to partner with you to resolve your challenges and demonstrate how our software can help. We want to exchange information with you about key trends in the childcare industry, strategies to promote and grow your program, as well as best practices for the next academic year. Come meet us in Booth 202. Time is growing short but you can still register to attend.